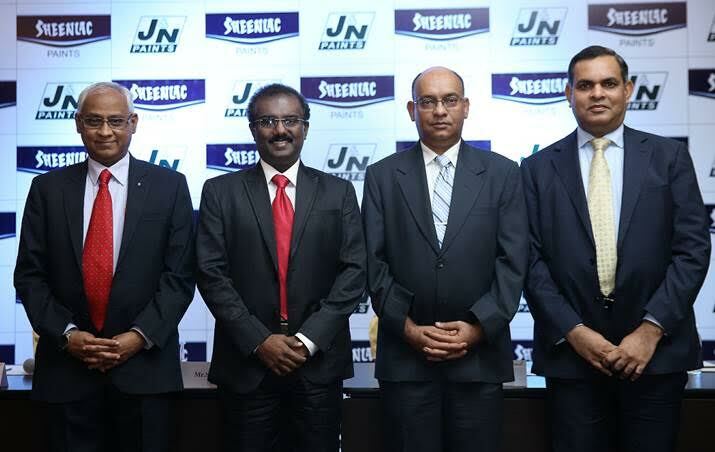 The Chennai based Sheenlac Paints ranked as the 6th largest paint company in India has entered into a JV with Jenson & Nicholson, which will enable both companies to leverage each other’s strength for growth and offer complete range of paint solutions and products pan India. The new entity would be called Jenson & Nicholson Paints Pvt. Ltd.
From L to R: Mr. Sridhar Krishnamoorthy, CEO, Sheenlac Paints, Mr. Sudhir Peter, MD, Sheenlac Paints, Mr. Anant Sinha, President, Jenson & Nicholson India Ltd. and Mr. Santosh Sridharan, COO, Sheenlac Paints. Mr. Sridhar Krishnamoorthy, CEO, Sheenlac said, “J&N is a reputed brand and we are delighted to market its decorative products. Their tagline, “Whenever you see colour, think of us”, is still vividly recalled by customers. Decoratives: Major segments in decoratives include exterior wall paints, interior wall paints, wood finishes and enamel and ancillary products such as primers, putties etc. Decorative paints account for over 70% of the overall paint market in India. Asian Paints is the market leader in this segment. Demand for decorative paints arises from household painting, architectural and other display purposes. Demand in the festive season (September-December) is significant, as compared to other periods. This segment is price sensitive and is a higher margin business as compared to industrial segment. Industrial: Three main segments of the industrial sector include automotive coatings, powder coatings and protective coatings. User industries for industrial paints include automobiles engineering and consumer durables. The industrial paints segment is far more technology intensive than the decorative segment. The paints sector is raw material intensive, with over 300 raw materials (50% petro-based derivatives) involved in the manufacturing process. Since most of the raw materials are petroleum based, the industry benefits from softening crude prices. The company was incorporated in the year 1962. It has 4 state of the art Manufacturing Facilities atPoonamallee, Vadakkanallur, Thirumazhisai & added Sikkandarabad by the partnership JV . The combined Plant capacity is 1 lakh KL per annum. Robust dealer network of 15,000+ touch points. Sheenlac is South India's largest paint company and is ranked no. 6 in the top 10 paint companies of India (the list from 1 to 5 are Asian, Berger, Nerolac, Akzo Nobel, Shalimar). Sheenlac’s product range includes decorative paints, industrial coatings, wood polishes, auto finishes, Primers, Fillers, Sealers and paint removers. Apart from a pan India presence Sheenlac is available in Sri Lanka, Mauritius and Vietnam. Incorporated in 1922, Jenson & Nicholson (I) Ltd., is India’s second oldest paint company. J&N pioneered many new products and trade practices which today are commonplace in the market. In 1955, it launched India’s first plastic emulsion paint under the brand Robbialac. It ventured into the powder coatings market in 1986, becoming the first company in the organized sector to offer this durable and environment friendly coating technology. In 1996, unfazed by industry scepticism, J&N introduced InstaColor in-shop tinting system. For the first time the Indian customer had the possibility to select among 5000+ shades instantaneously and create his/her own shade. The concept has revolutionized the industry. Recognizing the importance of the partnership with the distribution channel, J&N was the first paint company to start international dealer trip schemes. It’s oft repeated and mimicked advertising slogan – “Whenever you see colour, think of us” created a paradigm shift in paint advertising. For further details, contact: Mr. Aadarsh, Head-Marketing, Sheenlac Paints, 89031 42564,aadarsh@sheenlac.in; Mr. Satyan Bhatt, MD, Prism PR, 98400 85411, satyanbhatt@prism-india.com.